Oops - we don't appear to have a video for the DR-2080C. Place the Canon DR-2080C document management scanner on a counter top, the corner of a desk or wherever you want - Canon's innovative and space-saving design ensures an ultra compact footprint. It takes up less than half the area of most other scanners in its class, whether on standby or in use. Making it ideal for bank or government office counters, shop fronts and all busy enterprises where instant document capture is essential in a small space. 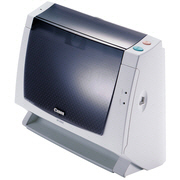 The DR-2080C delivers one of the fastest scanning speeds in the work-group category, at 20 pages per minute (A4 portrait, simplex, black and white, 200 dpi). It offers same speed simplex and duplex scanning for all paper sizes up to A4, with the added advantage of greyscale and colour capable scanning. So it can handle a wide range of work fast and efficiently - throughout numerous organisations and industries. You benefit from an extremely high optical resolution for 600 dpi work-group scanners, to ensure consistently superior image output. The DR-2080C minimizes image distortion, due to an innovative CIS sensor and lens array mechanism. This revolutionary design also cuts overall energy consumption, eliminates warm-up time and makes the scanner body frame more compact. Plug and play simplicity, clear control buttons and a range of user-friendly features ensure effortless operation for everyone. Best of all, the durable and dependable DR-2080C guarantees highly reliable operation, day in and day out. Canon's unique "retard roller" mechanism achieves highly reliable separation and feeding of documents for productive paper handling - while preventing any problems due to partial double feeding or dust damage. You can "Scan Batch Mail" or even to a PDF format. Bundled software for the DR-2080C includes ISIS/TWAIN drivers and Capture Perfect which offers you extensive scanning and saving functions with two new features. With "Scan Batch to Mail", scanned images can be instantly attached to a new message for multiple sending, using your existing mail program. Also scanned images can be saved in PDF format - in high compression or standard mode. OmniPage OCR software ensures full text OCR is also included. Thus amply optimizing all your image application requirements.